ALL Series RX-8 Keys (for replacement) and or the separate Key Modules/Transmitters. There are a total of 3 different Style and Type of replacement Primary Keys or Key BLANKS (uncut). Series I RX-8's there are the 3 different Keys. #1.. used up to July 1, 2004 Production uses the old style straight type one piece Primary Key with a separate Button Transmitter. 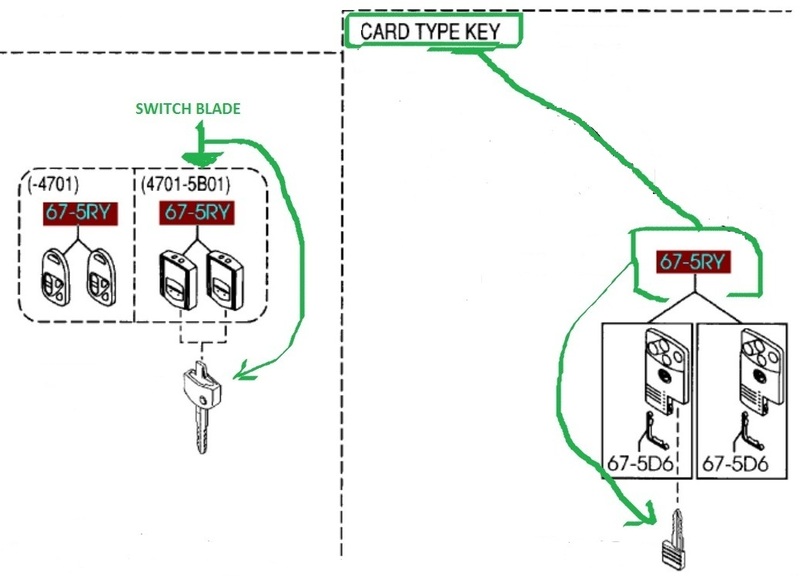 #2.. from July, 2004 the current Switch Blade or Retractable Key Blade was born which DOES NOT include *Transmitter, this is purchased separately. #3.. Card Type Keys used with the Advance Key-less Entry System (AKE). Series II RX-8’s also use the same # 2 (Retractable Key*) and # 3 Card Keys for AKE. the correct type depends if your car has Burglar Alarm or without a Burglar Alarm. Series I there are 4 different types (expensive) Key Transponder/Receiver Modules (Black Boxes). VIN Number REQUIRED, also with or without Burglar Alarm. Series II there are 3 different types (expensive) Key Transponders/Receiver Modules (Black Boxes). Series I there are up to 12 different Receivers (most for the AKE). Series II there are 7 different Receivers (most for the AKE). Series I there are 3 different types Antenna Coils which are located within Steering Wheel Ignition Switch/Lock. Series II there are 3 different types Antenna Coils which are located within Ignition Switch/Lock area. ‘AKE’ means Advance Key-less Entry (usually Push Button or Turn **** to Start Car, with no turn Key used). WARNING:...Be careful when ordering non OEM Keys or Key Transmitters (from internet, like eBay) as some will not work correctly with Transponders/Transmitters. Because there are so many combination and types if you are unsure please PM me with your VIN. We can not however always successfully diagnose issues you may have over the internet, particularly with AKE systems. If any of the many Receivers (say one of the 7 of 12) are inoperative then a non working AKE can occur, or check the Button Battery FIRST. AKE issues usually can only be resolve by a Mazda Dealer or by a person who has IDS/MMDS use for diagnosis and can plug diagnostics into your car. This applies to all Mazda’s which use Engine Immobiliser, etc. 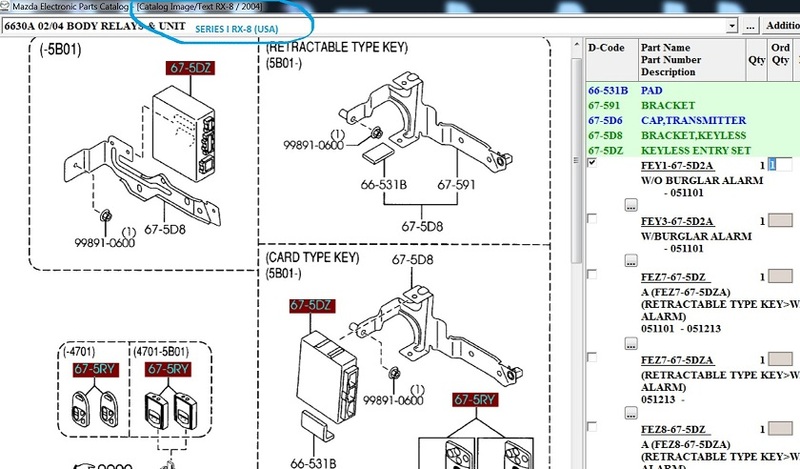 For any of these Keys or systems, PLEASE supply (PM or post) me with your FULL VIN Number so I can supply you with the correct Part Number or part numbers. Too expensive to get wrong, and too many types to guess correctly. EPC Example here is for an early 2004-5 Series 1 RX-8 WITH Burglar Alarm. Is it possible to have a type II (switchblade) key cut and programmed to work in an AKE car? No, all the many AKE receiver modules and their transmission frequencies are completely different to the Switchblade or normal Key-less Entry. Unfortunately AKE is just another layer of electronic garbage, more than twice the number of receivers/transmitters, more cost (to repair) and more hassles, all for what, lazy people who don't want to put in and turn a key. (IMO of course ). I really dislike the problems of last generation AKE give, normal Key-less is bad enough but is far more easier to fix, or renew. Having said this I believe the later systems used in the new Skyactiv models (new CX-5, 6, 3) are much better and better sorted/simpler...and no you can not use these on the RX-8 with AKE. the AKE on my Mazda3 works pretty good, at least when compared to what my father had for his CX-7 (now gone), which was the same **** they used on the late RX8 card type. that **** was weak and did I mention sometimes it doesn't work ? it will not unlock nor start the car, and battery was new. it seems like the card type was really sensitive to some electronic radio wave around the area. Never had a problem with the newer "bar like key type" AKE on my 2010 Mazda3. Is it possible to cut a plain (non - RKE) key for an AKE car? Basically I want another one of the keys that pulls out of the AKE, only with a hole in it so I can put it on a key ring. I assume there is some sort of resistor or chip within the spare key on the AKE cars, so you can't just get a 99 cent blank cut at the hardware store. NO, Buy a OEM replacement AKE Card Key and get it cut.. Thanks ASH, that is the info I was looking for. Just a general question....i have a series 2, but have had issues with this key unlocking and locking, the car detecting it....i ve replaced batteries. Doesnt help. Have people had trouble with these ? Druves me nuts ! do u have the credit card style keys ? Sorry to thread necro, but I didn't want to just post a duplicate thread about the same subject. So my 06 has advanced keyless. When I bought the car, naturally the owner only had one key. My last RX-8 was also a 2006 with advanced keyless that was unfortunately totaled by a driver that hit me head on. I still have the transponder and emergency key from my old RX-8. Is it possible to have this key re-programmed to my car? I know the procedure since I only have one working key with a blank replacement, but I'm just curious as to if the key programmed to my old RX-8 can be re programmed to my new one.